Since several people have been wondering about the status of J33 Keet, I thought I would post something here on my blog. The Center for Whale Research is the official population census organization for the Southern Resident Killer Whales. They publish official population counts twice a year - once in the middle of the summer and once at the end of the calendar year, based on the last sighting of each pod. 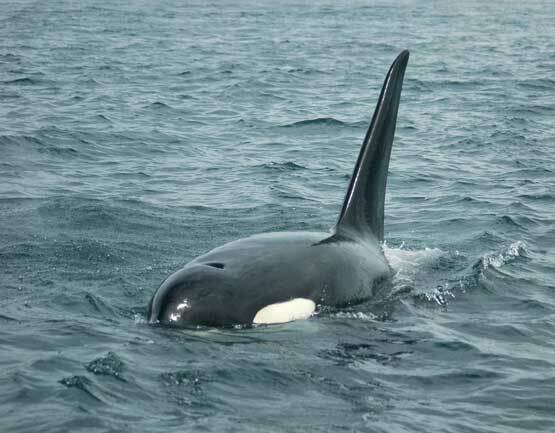 It is believed that J33 Keet, a male born in 1996 to J16 Slick, is missing, but he has not officially been listed as missing and probably won't be until the end of the year. Because I defer to the Center for Whale Research for official census information, Keet was not included in my Day of the Dead post earlier this month. If Keet has passed away, it is indeed a tragic loss. Along with L73 Flash and L74 Saanich that would make him the third young male orca that has passed away this year, which is certainly a cause for concern. I find myself especially shocked and saddened when a J-Pod whale passes away. Not only do I in most cases know them better as a family group because they spend more time in inland waters, but in the time I've known them they've always seemed like the most resilient pod. I've been closely following this population of whales since the year 2000, and in that time the only two J-Pod whales have passed away: newborn calf J43 in 2007 and adult female J11 Blossom in 2008. This means every other J-Pod calf born in the last decade (ten of them) has survived, a remarkable ratio, and only a single adult whale has died. Let's hope Keet is not in fact missing. If he is, let's hope this year is just an anomaly with the loss of three adult and sub-adult males, and not symptomatic of a greater problem as the loss of all the males in the late 1990s was. Regardless of the reason, Keet will be missed. We're from Maui and I just wanted to share with you our excitement over the return of the humpback whales to the Hawaiian waters. It's something that we look forward to every year. Here is a recent article about the whales that I think you might like. People here in Maui love the whales. We love them and protect them. What happened to Keet? What happened to his 2011 sibling? What happened to the males who died in the 90s that you mentioned? I'm curious. What do you think happened? You are there and watch them. I am in New Jersey and can only visit for a few days every few years; otherwise I follow the beloved orcas online. Ann Marie - We don't really know for sure; for the most part, whales just go missing and we never know the cause of death. It's thought that toxins played a role in the late-90s die off. One of the males we lost in 2000, J18 Everett, washed up near Vancouver, BC. His toxin levels were incredibly high, which likely compromised his immune system and led to the infection he died from. His sperm count was also reportedly zero, another potential side effect of the toxins. The toxin issue is a big one, but it's compounded by the whales not getting enough to eat. When there aren't enough salmon, they metabolize their fatty stores which is where the toxins are held. If they get enough to eat - like the more-contaminated transient whales - they're still carrying toxins but they don't effect their health as much. Thank you very much. I never knew about the sperm count problem. I thought the lack of babies was due to toxins affecting the mothers. I guess the fathers are affected as well.